← She’ll Be Coming ‘Round the Mountain–anytime now. Squee!!! KD Fleming's romance writing adventure began on a dare. But the real adventure started after she discovered she had the heart of a storyteller. Writing both sweet and inspirational stories about strong women who could be any one of us, her heroines are sassy and fierce. And once their hearts are engaged by the man who is destined for them, there's no chance the hero won't fall--but what a way to go. KD lives in sunny Florida with her hero husband of 15+ years. She loves music (all things Casting Crowns and OneRepublic), Marvel Movies--ALL things Avengers (ahem, *Robert Downey, Jr*, Chris Hemsworth, Tom Hiddleston, Chris Evans, Jeremy Renner, and Mark Ruffalo). Oh my! She spends her time taking care of her family, reading, writing, cooking, and coming up with new ideas for fun romance stories. 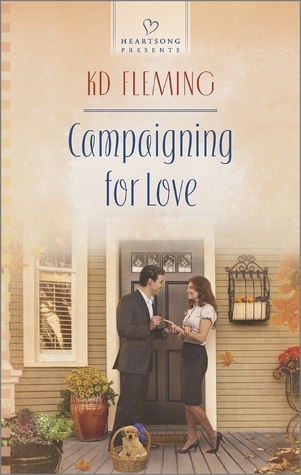 Posted on August 4, 2014, in News and Updates and tagged Book Launch, Campaigning for Love, Contest, Free Books, Golden Heart (R), Harlequin, Heartsong Presents, KD Fleming, Love Inspired, Pemberly Series. Bookmark the permalink. 4 Comments. I am so excited and eager to read your book! Thank you. I’m hoping you will really like it. Now that it’s really here, I’m nervous about what people will think of it. I just finished Campaigning for Love. A good read with a unique twist to a more familiar conflict. Thanks. I’m really glad you liked Nick and Kat’s story and enjoyed the twist. It was a fun story to write. Book 2 is about Jeremy and Abby and book 3 is about Gina and the reporter, Toby.